(Natural News) The criminal arrest of a high-level Treasury Department employee named Natalie Mayflower Sours Edwards leads straight to BuzzFeed, which is a radical left-wing, anti-American propaganda hub pretending to be engaged in journalism. Natalie Edwards reportedly leaked confidential Treasury Department reports to a BuzzFeed reporter in order to embarrass the Trump administration, according to multiple media reports cited here. “Prosecutors say reports on Paul Manafort, Richard Gates, and Maria Butina were among those leaked. Prosecutors allege Edwards photographed the confidential documents and sent them to the reporter using an encrypted messaging app,” reports Breitbart News. The illegal leaks spawned at least 12 news articles that attacked the Trump administration, reports Zero Hedge. “While the news organization was not named in the complaint, it lists the headlines and other details of six BuzzFeed articles published between October 2017 to as recently as Monday which they allege were based on the leaks. BuzzFeed reporters Jason Leopold and Anthony Cormier are commonly listed on several of the articles referenced in the government’s complaint,” Zero Hedge writes. Much of the radical Left’s propaganda push to try to destroy the Trump presidency has been based on illegally leaked tax records, financial records and other classified documents. In just the last two years, hundreds of journalists have openly published stories based on these illegally leaked documents, attaching their names to what has now become an irrevocable archival log of seditious criminal activity. “Natalie May Edwards, the senior advisor in the Treasury Department’s Financial Crimes Enforcement Network who was arrested Tuesday, leaked the documents to Jason Leopold, a reporter for BuzzFeed according to a Wednesday announcement by Manhattan federal prosecutors,” reports The Gateway Pundit. The complaint against Edwards says that she started leaking “numerous SARS in October 2017” to an unidentified reporter, and continued doing so until this month. She had “hundreds of electronic communications” with the reporter, “many via an encrypted application,” the complaint said. BuzzFeed complicit in a massive criminal enterprise… will fake news reporters also be arrested? I’ve been told from several sources that this arrest is just one of many that are yet to come. 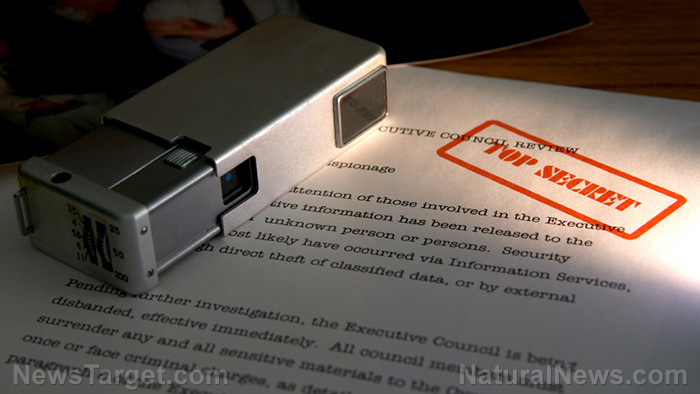 Self-declared “resistance activists” inside the U.S. government have been conspiring with left-wing “journalists” to leak classified documents that compromise national security and erode public trust in both government and journalism. I’m told there will be “dozens” of arrests of leakers who conspired with left-wing propagandists posing as journalists for several different organizations, including BuzzFeed. Another name given to me was “ThinkProgress,” by the way. It’s not yet clear whether the U.S. government will seek the arrest and prosecution of the propagandists themselves, or merely the deep state activists who initiated the leaks. There are hundreds of treasonous criminals currently posing as “journalists” throughout the left-wing media. An increasing number of observers are calling for their arrest and criminal prosecution for their active conspiracy to publish classified information as an effort to try to overrule the outcome of the 2016 election. Anti-American propagandists who pose as journalists currently work for the New York Times, the Washington Post, CNN and many other prominent anti-America news outlets. Notably, all these same treasonous left-wing “news” outlets are granted special protections by the tech giants like Facebook and Twitter. While all pro-America voices are being systematically silenced and banned, those organizations that despise America and are trying to overthrow democracy are granted total immunity on all the prominent tech platforms. Thus, Google, Facebook and Twitter are also complicit in the criminal conspiracies to undermine the United States of America. “We hope today’s charges remind those in positions of trust within government agencies that the unlawful sharing of sensitive documents will not be tolerated and will be met with swift justice by this Office,” US Attorney Geoffrey Berman stated, following the arrest of Edwards. Rumors continue to swirl that there are literally thousands of sealed indictments waiting to be activated against deep state traitors. This explains the desperation of the traitorous Left in trying to win the mid-term elections so they can try to halt the Day of Reckoning they’re all facing. Because nearly all the so-called “journalists” working for left-wing publications are, by definition, seditious traitors to America who are on the record attempting to thwart democracy and overthrow the duly elected President of the United States of America. The wheels of real justice are finally beginning to turn. Follow more news about the treasonous criminality of left-wing propaganda “news” organizations at Treason.news or Journalism.news.